My first sewing obsession of the new year was to make a bomber jacket. Every time I saw a bomber jacket added to Net-a-Porter or read some fashion editorial about varsity jackets as the latest thing, I decided I had to make one for myself. 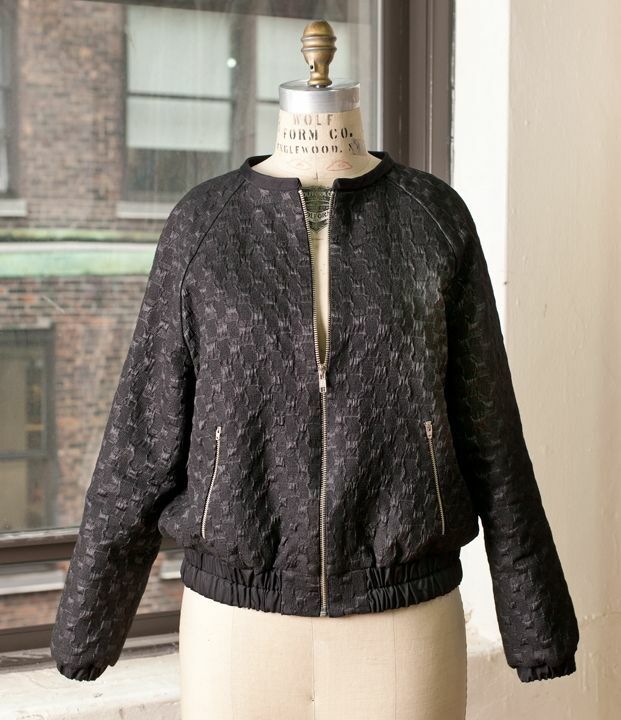 So, hmm, I knew I wanted to make a black bomber jacket, though I didn’t intend to make a textured bomber jacket. 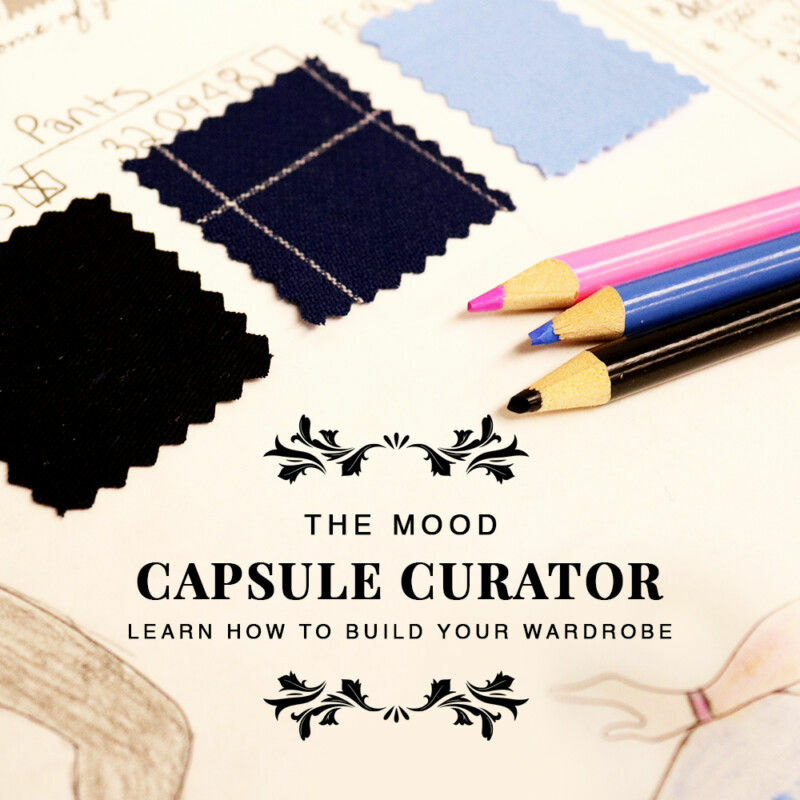 But readers, even though I work at Mood Fabrics and fabric is my business, I GET OVERWHELMED TOO! I was wandering around our silk department, pattern in hand, and I was an indecisive mess. Drool was practically coming out of my mouth, I was in such a stupor over which fabric to choose. But then our wonderful, longtime sales associate America thrust a bolt of newly arrived Marc Jacobs wool-blend brocade at me and said “Here, this is your fabric.” Actually, I think she just wanted me to quit taking up space on the sales floor, but I grabbed a couple yards of it and scurried back to my office downstairs. And this cotton brocade turned out to be a delight to work with. Don’t you just love it when fabric behaves? When a seam presses open perfectly and your stitches disappear into the fabric? We still have some of this brocade available at the Mood NYC store: call 212-730-5003, ask for America (or the silk department) and tell her you want Meg’s bomber jacket fabric; $50 a yard and worth every penny. 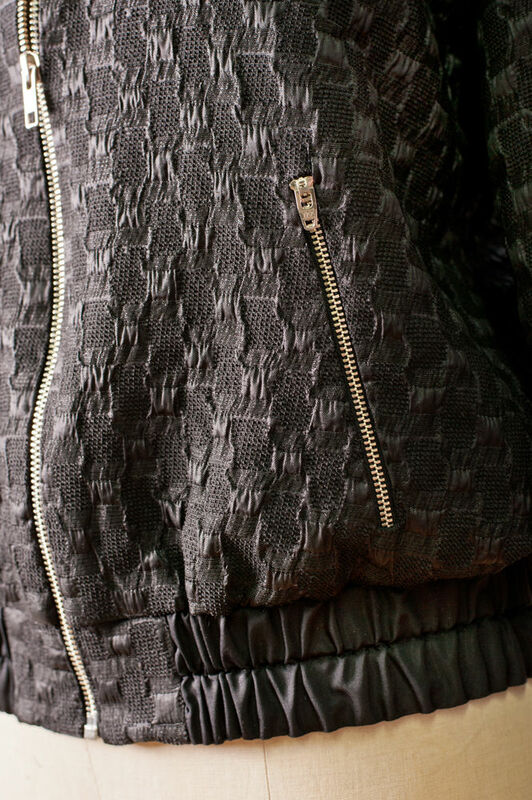 Above, a better glimpse of this textured fabric and some of the jacket details. You can see I opted to use elastic encased in silk satin rather than the called-for ribbing at the waist and cuffs. I tested a couple of knit ribbing options first, including a neoprene, but wasn’t happy with them. I do like the contrast of the smooth satin with the textured cotton. The zippers are pick-stitched rather than machine-stitched; I think that’s a little more elegant. I wish I had gone with a more expensive zipper rather than these ordinary YKK zippers, and that I had played a little more with zipper treatments before going the exposed zipper route, but oh well, live and learn. I chose not to line this jacket. The cotton fabric would have been fine without a lining but I decided to flatline it instead with some silk organza, just to give it a little wearing ease and a neat appearance when you see the inside of the jacket. (Flatlining is a technique where the fashion fabric and lining fabric are treated as one fabric, rather than constructing the garment first and then attaching the lining.) I basted the silk organza to the cotton brocade pattern pieces before I sewed the pieces together. Which pattern, you ask? It’s BurdaStyle 7210, and you can buy it from Simplicity.com; yay, no tracing involved! This pattern is very well drafted in the sleeve area and overall. The only adjustment I made to the pattern itself was to narrow the sleeve width slightly (personal preference), and to omit the front and back flaps. – Seams are either Hong Kong-finished with satin bias tape or serged. – The neckline finish consists of a silk satin bias piece that is lined with some neoprene I had around, just to give it some fullness. 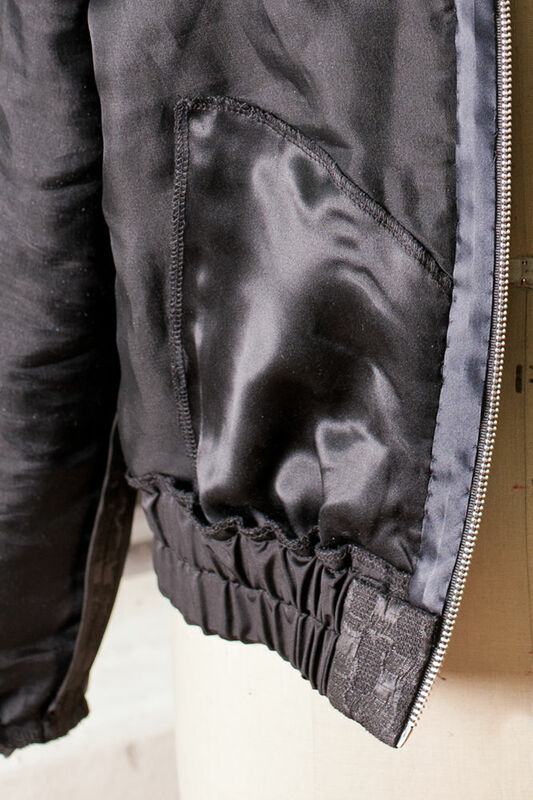 – I hate when the zipper tape shows on the wrong side, so I covered it with satin bias tape (handstitched). – Pockets are made from black silk charmeuse I had in my stash. Bottom line: Really, really pleased with this jacket, though it ended up being a little more structured in appearance than a typical bomber jacket. I wear it unzipped over a t-shirt or turtleneck, and with jeans or black or tan pants. Sewing construction actually was easy and it all came together fairly quickly. In fact, I’m now working on another interpretation of the bomber jacket, this time in ivory neoprene with lace overlays…. Thinking about making a bomber jacket? Really, the fabric options for this type of jacket are endless. I’d consider lighter-weight fabrics with some body, soft hand and relaxed drape, maybe a medium-weight satin. Take a look at bomber jackets in stores and online and see what fabrics work best, then go for it! It is truly a gorgeous jacket. Love the details and the zipper treatment you chose is a perfect look for this jacket 🙂 love the fabric too! This jacket is just gorgeous. I love all the details, from the fabric to your innards. Love it! stunning. i love that story about america, and i love that zipper! hell, i thought YKK was the good stuff, so there ya go…. You should be pleased with this because it’s gorgeous! Just gorgeous! Amazing jacket, Meg, your construction is beautiful. Gorgeous! I want a jacket like this too! Ok, I”m really intrigued with the elastic encased in silk satin. Where can I get some? Mood? I need a URL. Must have some ASAP! MaryBeth, I made this myself. Basically, the silk satin is stitched to be a casing for the elastic, which I inserted myself. Does that make sense? The jacket is drop dead gorgeous, Meg. I’ll get there one day I hope. Question – does Mood sell satin bias tape or did you make it? No, we don’t sell this kind of satin bias tape, though I wish we did. Dakota Braids and Trims on W. 39th is the only place I’ve found this particular type. Most often I make my own. 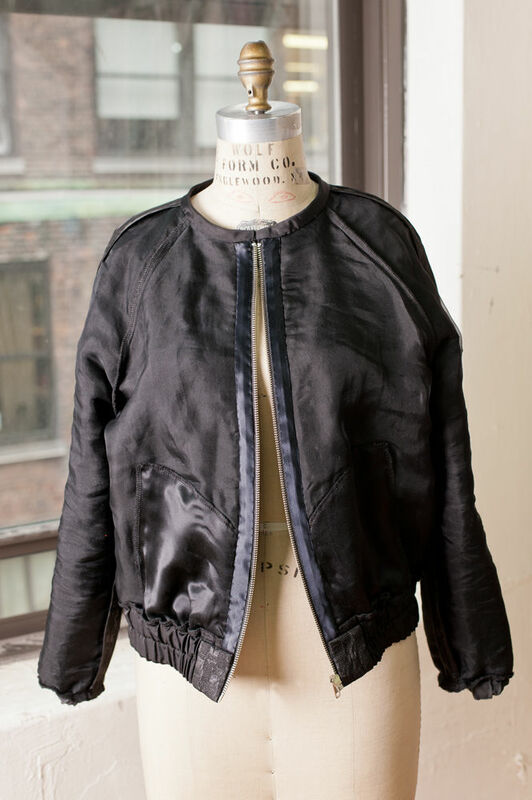 I didn’t know that I needed a Bomber jacket until I read this post. Beautiful jacket! Love that you shared the inside–I may have learned some tricks. Lovely!!! And thanks so much for the flat lining tip!! Gorgeous jacket, Meg! You’ve got me thinking I should grab that pattern! What a great take on the “spring jacket”! Great looking jacket. Love your fabric choice. Absolutley gorgeous! It is so nice to see something come out of your sewing room even though you are so busy. Very inspiring – enjoy wearing this beautiful jacket this spring! Great Jacket!! Thanks for sharing. How does flatlining differ from underlining? Underlining is sandwiched between the fashion fabric and the lining. Flatlining is similar to underlining in concept but you don’t add a lining; it’s just the fashion fabric and the flatlining fabric treated as one layer. Flatlining is used for theatrical costumes because it can make them more durable and comfortable to wear; you’ll also see it on vintage dresses, with cotton frequently used as the flatlining fabric. Awesome jacket! Love it! That fabric is wonderful, too! Meg, thanks for your response. If I look closely, it looks like the elastic is ruffled…am I right? If so, I know what exactly to look for. MaryBeth, think of a casing that you’d have for an elastic skirt or around the sleeve cuff for a jacket and you’ll understand what I did here. I took silk satin and used it in place of where the pattern called for ribbing, since I didn’t like any of my ribbing options. The silk satin is about four inches wide times the circumference of the jacket. I folded it in half and stitched down the middle, lengthwise. This created two casings for me to insert the elastic. Hi Meg, that is a fabulous jacket! I would love to attemp to make one myself but I am really new in to sewing and this will be a big challenge. Did you make the patten yourself? I really can not make patterns do you know where I could get a pattern similar to this? The pattern I used is BurdaStyle 7210, which I do not recommend for beginning sewers who rely on clear instructions to get from step to step. Bomber jackets are more for intermediate sewers. Try a collarless jacket with very few pieces first, then work up to something like this. Many thanks i will follow your advise! How deep is the ribbing on the pink velvet jacket in the photo ? I’d like to make mine that high T the back of the neck of my bomber. You did an awesome job on this bomber jacket. I think you’ve inspired me to do one myself!!! Thanks for posting!